View the Labels/SDS information for Ference Insecticide. Ference® insecticide contains the active ingredient, cyantraniliprole, which will raise the bar on season-long control of ABW (annual bluegrass weevil). Since Ference systemically controls all larval stages, it provides superintendents greater flexibility later in the year when ABW populations are asynchronous. 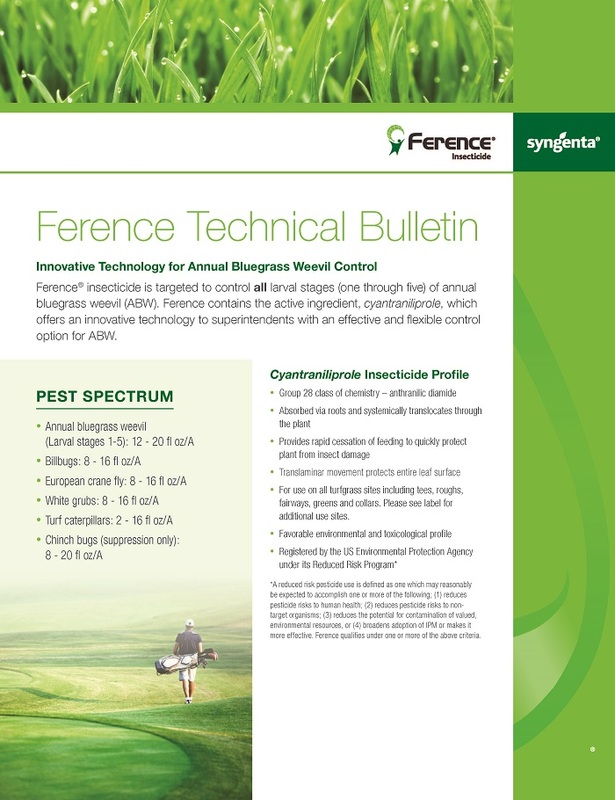 Ference will provide increased and extended control of ABW through the enhanced Syngenta Optimum Control Strategy, found on WeevilTrak.com. Systemic control of ABW at all larval stages (1st - 5th instar). Ference stops turf-feeding damage within minutes after ingestion; larvae die within hours to days depending on insect life stages and species. Manages a broad-spectrum of insect pests including: billbugs, European crane flies, white grubs, turf caterpillars and suppression of chinch bugs. Improves control of asynchronous ABW populations, which have multiple life stages present at the same time. Provides a new resistance management tool and rotation partner to help control pyrethroid-resistant ABW. 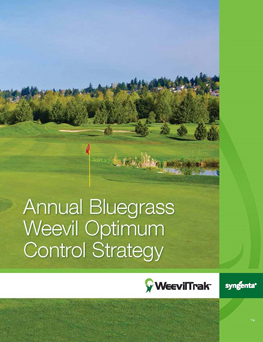 Increased control of ABW with the Syngenta Optimum Control Strategy through WeevilTrak.com. Ference compliments and enhances an ABW program with Acelepryn®, Provaunt® and Scimitar® GC insecticides for extended, season-long control of ABW. Application is based on degree days and ABW activity. Some areas may require two applications spaced 14 days apart. Application should be applied prior to egg hatch to ensure that Acelepryn is in the transpiration stream prior to larvae feeding. Application should be applied when the third stage larvae exit the stem to feed on the crown and surface roots. * Application timing varies based on geography. For precise timing applications, visit WeevilTrak.com. Application is based on the presence of adults. Application should be applied about 7 to 14 days after adulticide. Application should be applied about 14 to 21 days after Provaunt. Application should be applied about 21 to 28 days after Ference. ** Application is recommended if there is a high population of adults with the presence of callow and mature adults. Ference insecticide is targeted to control all larval stages (one through five) of annual bluegrass weevil (ABW). Ference®, Greencast® is a trademark of a Syngenta Group Company. Acelepryn®, Provaunt®, Scimitar® are trademarks of a Syngenta Group Company. Ference® is a Restricted Use Pesticide in the State of New York. Scimitar® GC is a Restricted Use Pesticide. Acelepryn® is not for Sale, Sale Into, Distribution and/or Use in Nassau, Suffolk, Kings, Queens counties of New York State. Ference® is not for Sale, Sale Into, Distribution and/or Use in Nassau, Suffolk, Kings and Queens Counties of New York State.